Harlem Tavern | HarlemGal Inc.
Move over Fifth Avenue, Harlem is getting into the holiday windows game. Spanning the corridor of Frederick Douglass Boulevard between 114th and the 122nd streets, eight Harlem businesses will display windows designed and executed by fifteen students from the Fashion Institute of Technology’s (FIT) Visual Presentation and Exhibition Design (VPED) BFA program. The window displays will depict holiday-themed scenes from the Harlem Renaissance. The windows will be on view from November 30 to January 2. Visitors are invited to stroll through the historic neighborhood throughout the holidays and enjoy the window displays, while learning a bit of Harlem’s rich history. To kick off the season, two free window tours on November 30 and December 3 will be provided by ArtCrawl Harlem, Inc. The tours will feature live storytellers and vignettes with actors and performers bringing the windows to life. The family friendly outing will also include free children’s activity and coloring books, highlighting historical themes of the period, and refreshments from some of the participating restaurants. Harlem Holiday Windows free kick off event will start at the Harriet Tubman statue on 122nd Street at 5:30pm on November 30, and will feature an interactive and intergenerational music performance by special guest Shine and the Moonbeams. The second kick off, also starting on 122nd Street, will be at 3pm on December 3, ending at the Shop Harlem Live Harlem Holiday Expo at MIST. Produced by Harlem Park to Park, the program will include an art filled afternoon for kids and adults. In addition to the free kick off tours on November 30 and December 3, a full schedule of paid tours and programming around the Holiday Windows, will be offered by ArtCrawl Harlem, Inc., throughout the holiday season, from November 30-December 21. Programming will include weekly tours on Saturdays from 3–5pm (dates include December 3,10, 17).Registration is available on the website. Rates are $10 per person or $150 for groups 15-25. Tours are available for groups by special request. For more information on Harlem Holiday Windows, and the participating businesses visit http://www.harlemholidaywindow.com or call 212.866.7427. The business team behind Harlem Tavern, is expanding their presence in Harlem with a new place tentatively called Harlem Standard, a restaurant and bar at 2128 Frederick Douglass Blvd. The space is under construction now and has the word Harlem spelled out in cool graffiti art. 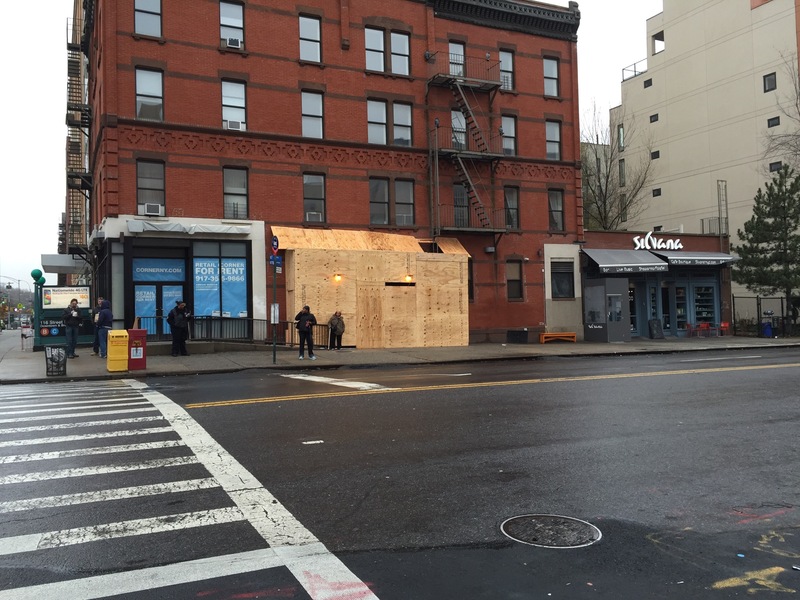 When you walk by the southeast corner of 115th Street and FDB, that’s where upcoming Harlem Standard will be. While we were all enjoying our Thanksgiving holiday, Harlem’s celebrity chef Marcus Samuelsson decided to break news to The New York Times that week about his next restaurant opening in Harlem, which will be where else….but on Harlem’s restaurant row, aka Frederick Douglass Blvd. from 110th Street to 125th. 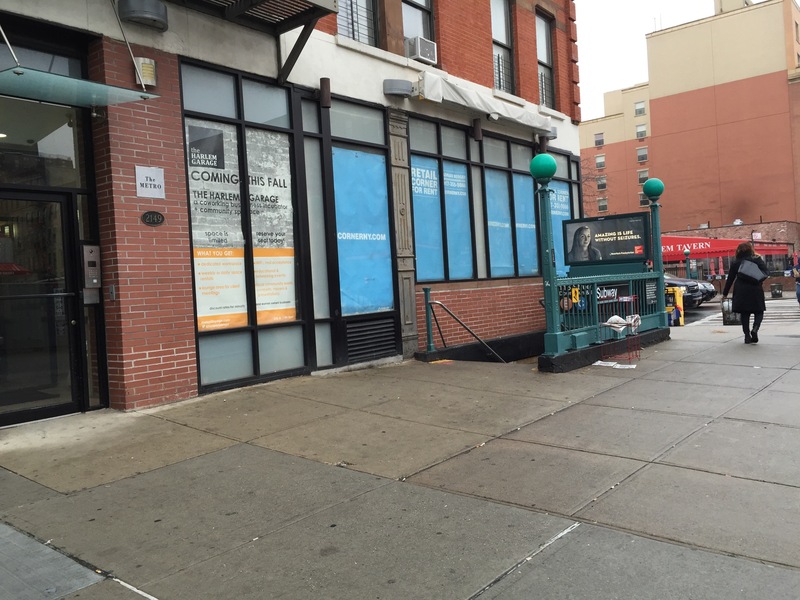 The actual location will be on the southwest corner of 116th Street and FDB–right by Harlem Tavern and Silvana. The name will be Streetbird Rotisserie. His first Harlem establishment is Red Rooster. All the info above was confirmed by his PR rep. When I learned of this news, the things that came to mind was why not open a place on FDB to begin with? And why open a restaurant there now? 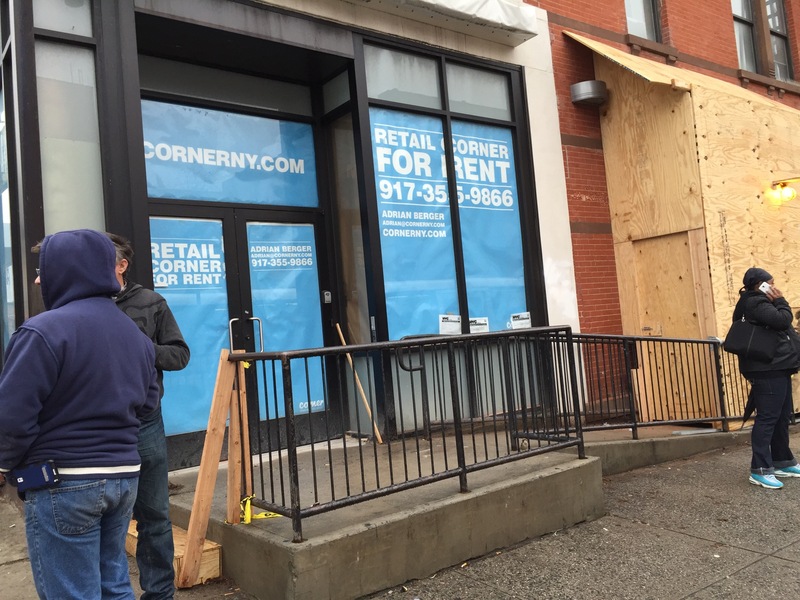 Opening is set for Spring 2015, which in the restaurant business means Summer or Fall 2015! So much for that diner my readers keep asking for! It ain’t happening. It is going to be a busy Monday evening in Harlem tonight, August 26. There is something to do for everyone along Harlem’s restaurant row. Update, the event mentioned at Melba’s is by invite only. 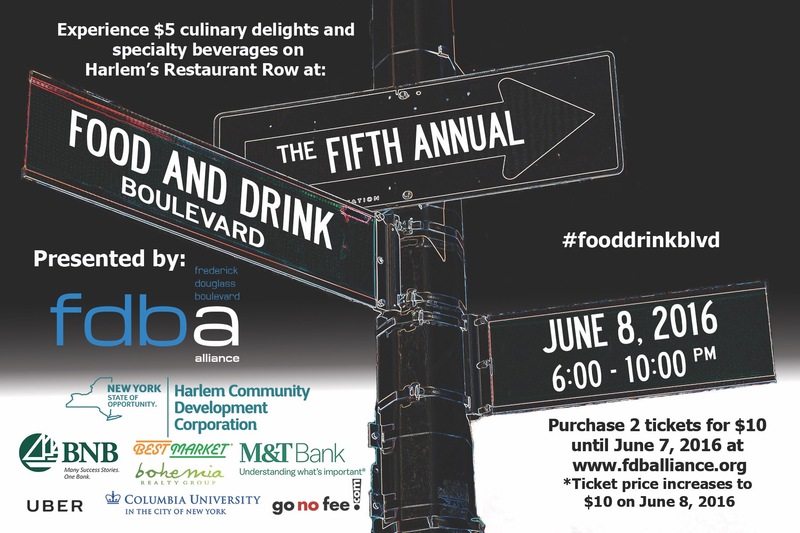 Two blocks down, Harlem Tavern at 116th Street and FDB is hosting Uptown Battle of the Bars Showdown Finale event. It starts at 6 pm as well and runs until 9 pm. 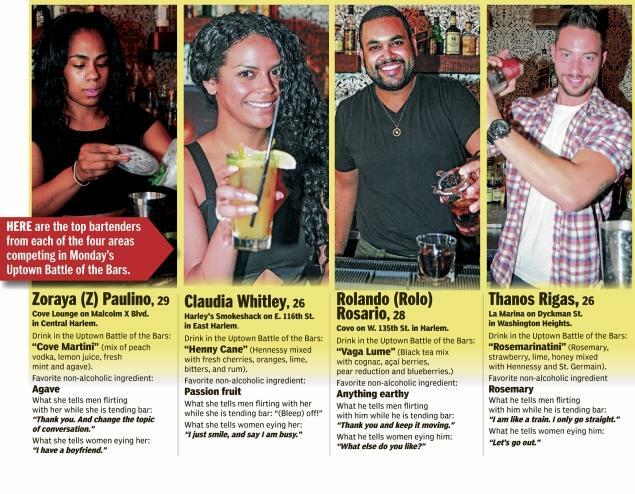 Three dozen bartenders have been engaged in a competition since the beginning of August dubbed the Uptown Battle of the Bars. Tonight, the winner will be announced. Learn more about the event here. And last, but certainly not least, Lido Harlem will be hosting another Gayborhood mixer event this evening starting at 6 pm as well running all the way to midnight. 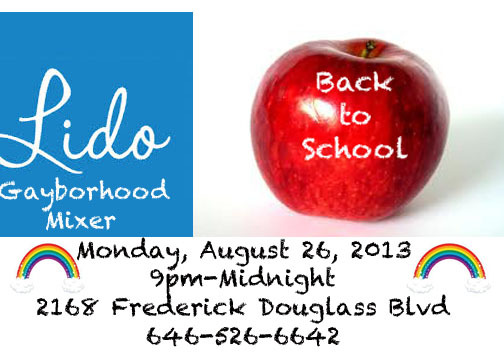 Lido Harlem is located at 117th Street and FDB! There ya have it! A busy Monday evening in Harlem! Enjoy! 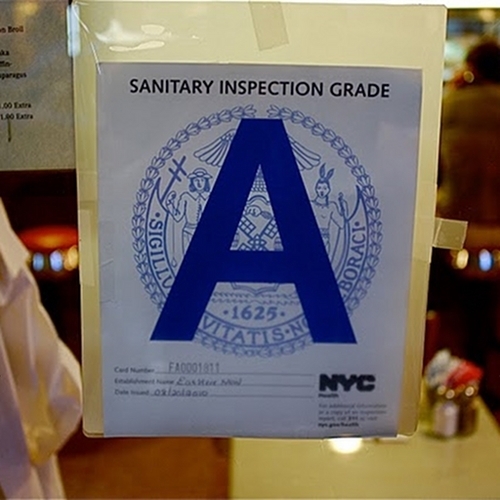 Wondering which Harlem restaurants get an A in the health rating area? Find out now how Harlem restaurants make the grade. NYC Health Ratings recently posted a tweet on Twitter about the latest health ratings for Harlem restaurants. If you’re interested in knowing who gets an A, view them all here! 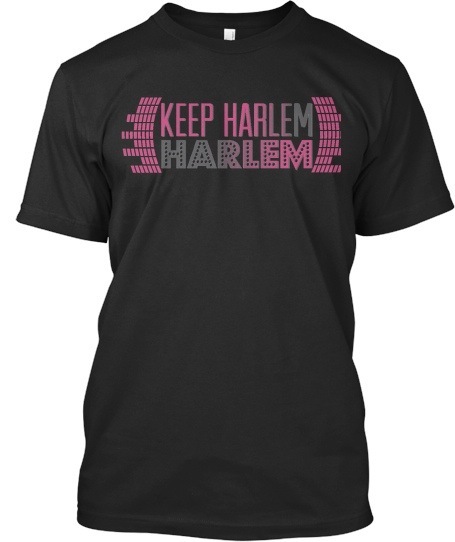 Harlem Tavern, the two-year old restaurant and bar at 116th Street and Frederick Douglass Blvd., is ready to take their business model uptown to the Heights! 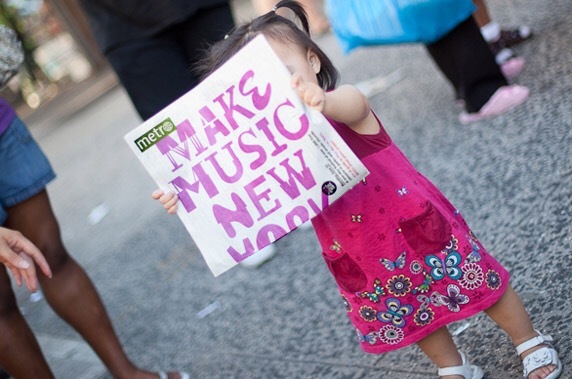 It’s been well-publicized. 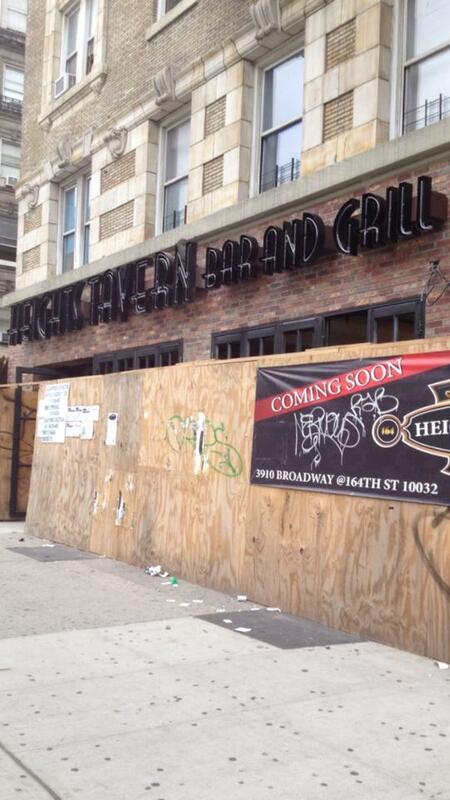 Yesterday, Harlem Tavern unveiled on their Harlem-focused Facebook page a photo showing signage for their second uptown location called Heights Tavern, which will be at Broadway and 164th Street. It was also announced on their page that Heights Tavern will be having “an open call this Wednesday-Friday (June 26-28) from 1-4 pm” at this new location. Congratulations to Harlem Tavern owners, Gareth Fagan and Stephen and Sheri Daly, on their expansion. Clearly, the Harlem Tavern business model has returned a big ROI proving uptown Manhattan is the place to be! Read full coverage here on Harlem Tavern.